The Katz Center hosts conferences that bring together scholars and practitioners from the United States and Mexico to discuss relevant issues. Previous conferences have discussed themes ranging from democracy in Mexico to the historical evolution of Mexico City. Below please find an archive of previous conferences. A hundred years after the creation of the ejido of the Mexican Revolution, the Katz Center at the University of Chicago brings together an interdisciplinary group of scholars to debate the current state of knowledge and research about the agrarian institution that revolutionized the social, economic, and political organization of the Mexican countryside during the course of the 20th century. In the 1970s, under the expert guidance of John Coatsworth and Friedrich Katz, the University of Chicago emerged as one of the world’s leading centers for advanced training in the study of Latin American history. The conference brought back some of the prominent scholars who received their PhDs at Chicago (from the 1970s through the early 1990s) to reflect upon and celebrate that living legacy. In recent years the dynamic organizational development and political and civic participation of Mexican migrants in the United States has drawn ample scholarly attention. This conference brought together researchers who have focused on the city of Chicago as a site for immigrant activism and activists with significant organizational contributions in Chicago, bringing to bear their different disciplinary and experiential perspectives. Participants analyzed Mexican migrant organizations based in Chicago and their struggles to promote migrant political participation, rights, culture, and infrastructural improvements in their hometowns, within a binational or transnational framework. Panels included “Space and Place in Transnational Participation of Mexican Migrants”, “Public Visibility and Representations of ‘the self’ among Mexican Migrant Organizations”, “Political Agency of Mexican Hometown Associations and Government Institutions in Chicago”, and “Beyond Hometown Organizing”. “Constructing Mexican Democracy” aimed to explore the state of affairs and the challenges that Mexico faced in the eve of its 2012 presidential elections. Speakers included presidents of seven different Mexican parties, as well as scholars from the University of Chicago, Notre-Dame University, and the University of Illinois at Chicago. The conference took place at the Chicago campus of the Notre-Dame University, and was organized by the Federal Electoral Institute of Mexico (Instituto Federal Electoral, IFE) and the Kellogg Institute for International Studies of Notre Dame University, along with the Katz Center for Mexican Studies, and the Center for Latino Research of DePaul University. This conference explored the evolution of Mexico City, from Tenochitlan to the monstrous city, from a range of historical perspectives. Presenters included Pablo Escalante on Mexico-Tenochtitlan, Jaqueline Holler on the renaissance city, Antonio Rubial on the baroque city, Luis Fernando Granados on the neoclassic city, Mauricio Tenorio on the modernist city, and Diane Davis on the monstrous city. This one-day conference sought to consider the upcoming bicentennials of Argentina, Chile, and Mexico in historical context. 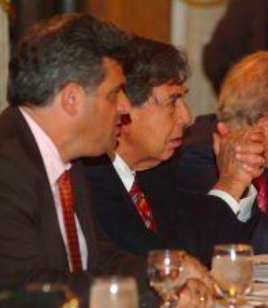 The conference included the following presentations: “Economic Consequences of Independence Movements,” by Chilean Economist Samuel Amaral; “On Argentinian Independence,” by Argentinian Historian Jorge Myers; “On Chilean Independence,” by Alfredo Jocelyn-Hoyt; and “On Mexican Independence,” by Mexican Historian Luis Fernando Granados. Six scholars of twentieth-century Mexico participated in a colloquium on the multiple and conflicting legacies of Andrés Molina Enríquez’s book, Los Grandes Problemas Nacionales, one hundred years after its publication. Molina is considered to be one of the principal intellectual precursors of the Revolution of 1910 (its Rousseau, according to some), and his book has long been regarded as one of the most influential studies of Mexico’s social problems produced in the twentieth century; it also provided the intellectual foundations for Mexico’s post-revolutionary agrarian reform program. To celebrate the eightieth birthday of Professor Friedrich Katz, the University of Chicago organized an international conference in his honor. Leading historians of nineteenth and twentieth-century Mexico came from around the world to discuss the comparative and transnational history of Mexico during the formative years of the modern nation (1880 to 1940, roughly). The aim of the conference was to produce a book of exceptional interest not only to historians of Mexico, but also to social scientists, students, and the reading public. Essays addressed a broad range of issues, including the social roots of Mexican nationalism and internationalism, the transformation of the Mexico-U.S. boundary into a distinctive borderland, and the history of rural immigration from Mexico to the United States. A panel of scholars discussed peasant communities in Mexican history. Among the topics addressed were the history of these communities, ideas surrounding the definition of community, and the image of community within historiographical, political, and legal frameworks. Following the turn of the century, a critical turning point in Mexico’s political history, Mexico faced the continuing challenge of redefining the political system as a whole. For this conference, Mexico’s leading policy makers, civil society practitioners, and academic researchers joined university students and leading members of the Hispanic community in the Midwest region for a discussion of the challenges of institutional reform, party politics, and the involvement of civil society in Mexico’s political process. Participants included the Minister of Government Santiago Creel Miranda; Cuauhtémoc Cárdenas, three-time presidential candidate and founding member of a leading opposition party; José Woldenberg, former president of the Federal Electoral Institute; Beatriz Paredes, former leader of the House of Representatives; Enrique Semo, Mexico City’s Secretary of Culture; Marie Claire Acosta, former Secretary of State for Human Rights; and Carmen Aristegui, a top Mexican radio news anchor and political journalist, among others. Mexican history professor Emilio Kourí and founding member of the PRD, Cuauhtémoc Cárdenas.